Gartner Group published a report titled Magic Quadrant for Team Collaboration and Social Software (ID#G00151493) this week. 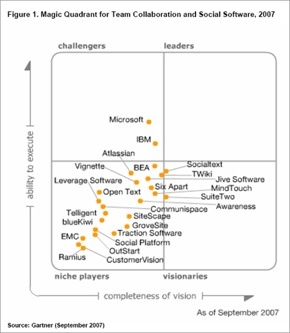 The money shot in any Gartner report is, you guessed it, the magic quadrant. What makes this quadrant so fascinating is that there are no leaders according to Gartner, and only two who qualify as visionary but in reality only one (more on that later). In fact, according to Gartner, there are only two companies that are above the line with regard to ability to execute. Well that's kinda interesting. Here at NewsGator this report was the topic of much discussion. We were debating our decision not to participate in the group of companies Nikos Drakos included in the analysis and we tried to make sense of the large cluster of companies in the niche sector. The Gartner view of team collaboration and social software, and this is just an observation and not a judgement, is still rooted in the blogs and wikis mindset, which is not what we do so according to how Gartner is segmenting the market there really wasn't much upside for us. We believe the market is much broader than Gartner is allowing, encompassing content relevancy, discovery, and surfacing (what you need, when you need it, and in an app that can use it), user profile data, user initiated action, such as sharing and tagging, coupled with user generated content. Of course, were Gartner to include the full spectrum of collaboration offerings then the niche sector in this quadrant would be overwhelmed with companies. The other observation I would make about this quadrant, which is that several of these companies are in fact represented in several places. Our friends at Socialtext participate in Intel's SuiteTwo, along with NewsGator and SixApart, and also over on Microsoft's Sharepoint with a bolt on wiki, as does Atlassian. In retrospect, not participating in this report was basically the right decision. This market is in the early stages of development, and as Nikos rightly concludes, it's early enough to declare there to be no leaders. Consolidation is inevitable and the companies that successfully offer an integrated suite of products will ultimately move to the leader sector. This validates our decision to engage with ecosystems as opposed to creating buckets of functions that overlap with what our customers platform vendors are offering, and the already mentioned SuiteTwo package is a great example of how an integrated suite can capture visionary status through offering a best of breed suite with integrated administration capabilities. We made a strategic decision to partner with Microsoft on not only Sharepoint with our Social Sites product but also the broader Microsoft stack with our NewsGator Enterprise Server and this enables us to move in the market with the ease of knowing we are benefiting from the platform investments and customer reach that Microsoft enables. Gartner is right, there are no true leaders in this market right now but the market is accelerating and leaders will emerge in the next 12 months based on core product strength, partner development, and of course, customer acquisition. -- Jeff Nolan is VP Corporate Development for NewsGator Technologies. Too many media owners - especially newspaper publishers take a Ptolemaic view of the universe: with themselves right at the centre. The truth, of course, is much more Copernican. We are simply a small planet spinning around. JupiterMedia's found a way to use blogs to boost its business. Over a dozen Jupiter analysts post blogs on the jupiterresearch.com Web site. The at-times offbeat journals are stirring sales leads from clients who otherwise might not have contacted Jupiter, says David Schatsky, chief of research at JupiterMedia's Jupiter Research unit. "One example is tech vendors whose marketers are checking to see if Jupiter mentions their products and what we say about them," Schatsky said. I predict that within two years, not having a feed for your corporate news will be analogous to not having a Web site. It will mark you out as unresponsive and retrograde, writes Paul Kedrosky in the June 2004 issue of Harvard Business Review. But if you think it is just about providing a RSS feed for your press releases, you are very mistaken. It is about making all you data-generating transactions available to your customers. If you don't, then they will leave you. And it doesn't stop there. If [in two years] you're not aggressively tapping feeds yourself, you'll find that you're a step behind your more aware customers, suppliers, investors, and competitors. A strong statement? Not strong enough, we would suggest. The future is not two years away, it is here, now. We work with customers who are now getting a real and measurable competitive advantage from using these technologies to change the way they work. The increase in productivity is dramatic and sustained. "First, make sure the executive team understands syndication and its implications. Next, make sure your IT people keep syndication top of mind as the refine your systems and infrastructure. You are soon going to be a de facto broadcaster, and your technology infrastructure must be able to support that role. Finally, think about what information you could feed. Consider what event data you generate, who would want it, and how you could benefit by syndicating it. Ask yourself, why not? " RSS is about to hit the mainstream. In fact, companies such as Amazon, Walt Disney, and Macromedia are already testing RSS to distribute news and info to customers and business partners. ...big companies are starting to use RSS in two ways: to improve in-house communications and to send out marketing and public-relations information previously relegated to email newsletters and news releases. ...The person who runs your company's intranet will probably benefit sooner from RSS than you will. More companies use RSS to manage internal communications and keep remote employees such as salespeople and field-office personnel in the loop without drowning in irrelevant information. Technology companies such as Macromedia, maker of Shockwave, Flash and Dreamweaver programs for Web programming, use RSS feeds to pass on software beta versions and product updates and changes.